Although the advent of crashpads has significantly altered the nature of spotting in bouldering there is no question of its importance. In this post I want to discuss briefly the nature of spotting back in the day and how it has changed. When bouldering in America was initially practiced seriously, in the late 50s through the mid 70s, it was a ground-up affair. Even if topropes were occasionally used, the attitude was that falling was a sign that the climber needed to start over. Rarely did climbers hang in place anywhere and pre-inspection was almost unheard-of. This, along with the absence of prepared landing surfaces such as pads, meant that even low problems could be very serious indeed. Although mats were used in gymnastics, which is where much of the idea of bouldering came from, they did not find wide acceptance in climbing until the mid-1990s. Even today, I will encounter older climbers who refuse the offer of a pad, even though their body language on the problem says they could really use it. Spotting was so important then because the ground was so hard and irregular on even the most level and clear landings that an unbroken fall of even just a few feet could twist an ankle or break a heel. My theory is that spotting, also typical of gymnastics, was acceptable at that time because it mirrored in some sense the climber-belayer relationship typical of roped climbing and preserved a sense of ground-up adventure. This view might explain why pads were slow in being adopted. Certainly, the technology involved in pad manufacture or use is trivial and climbers could have been using them much earlier. Spotting in the pre-pad era consisted, much as it does now, primarily of stabilizing a climber's landing or directing the climber to a safer landing. However without a pad the consequences of a poor spot were potentially much more severe. This is perhaps why many classic problems from this era were rarely dynamic, steep compression affairs but instead more typically vertical or slightly overhung face climbs, problems that usually allowed a certain amount of time to climb down if possible or at least fall with some advance notice. Thus spotting was done in the manner typical of highball spots today, providing moral support as much as anything else. Today, the situation is quite different on many problems. The crashpad has rendered spotting in many situations irrelevant as the climber moves above a sea of pads a few inches below her back. Indeed, on many steep problems, there is no room for a spotter anyway. A plethora of pads removes the need to direct the climber as he can land anywhere safely, even in a talus field, if the pads are placed well. Spotting has become for most a kind of lost art, rendered obsolete by new approaches and equipment. That said, spotting remains a valuable skill in a number of situations. The ability to keep a climber upright and reasonably stable during impact can make you a valuable companion and bouldering partner and the ability to communicate this skill to others may save your own skin in a bad situation. More on how to fall and how to spot in the next post. 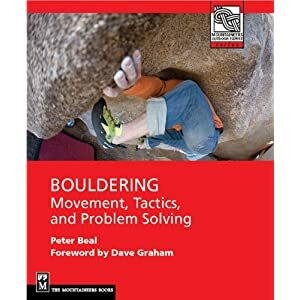 Somewhat relevant (probably more so to your upcoming post): The best spotting advice/guide I have seen was/is in the Squamish Bouldering (or possibly Squamish Select) guidebook. Clear, simple, easy-to-follow advice. Worth a look if you know someone with a copy. I'll look around for it Julian. Thanks for the info! To become really good in spotting, bouldering and mountain climbing, you will certainly need a background in gymnastics. Here, your body must be flexible enough and you must have enough body strength.